Coming to America 2, the highly anticipated sequel to the 1988 film starring Eddie Murphy, finally has an official release date! The movie will hit theaters on August 7, 2020. The movie does not yet have an official title and it’s unclear yet if original cast members Arsenio Hall, James Earl Jones, Shari Headley, and John Amos will return. Eddie has been confirmed to return. If you haven’t watched the original, the film is about Prince Akeem (Murphy), who travels to Queens, New York to find a wife with a strong will. The film is considered a classic comedy! Stay tuned as we find out more about the sequel. Eddie Murphy Goes for Morning Coffee Run in L.A.
Eddie Murphy picks up his coffee and a snack as he steps out on Saturday morning (January 19) in Los Angeles. The 57-year-old actor tried to keep a low profile in a black hoodie and dark sunglasses as he stepped out for his morning coffee run. If you missed it, over the holidays, Eddie shared a super rare photo with all 10 of kids – including newborn son Max! Eddie and fiancee Paige Butcher welcomed their second child together at the end of November. 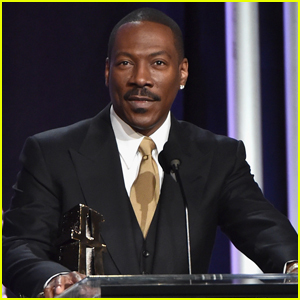 Eddie Murphy Shares First Family Photo with All 10 Kids! Eddie Murphy celebrated Christmas with his entire family! The 57-year-old actor’s daughter Bria took to Instagram on Tuesday (December 25) to share a photo with all 10 of Eddie‘s kids – including his fiancee Paige Butcher, his mom Lillian Murphy, and Paige‘s mom. Included in the photo were kids Eric, 29, Bria, 29, Christian, 28, Miles, 26, Shayne Audra, 24, Zola Ivy, 19, Bella Zahra, 16, Angel, 11, Izzy, 2, and his 10-week-old son Max. Eddie and Paige welcomed Max at the end of November – just a few months after it was confirmed that the pair was engaged. You can see the photo of Eddie and his 10 kids on Bria‘s Instagram here! 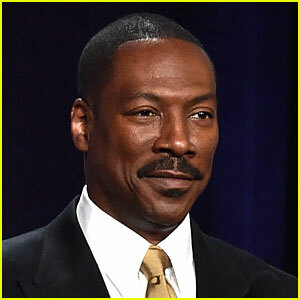 Eddie Murphy just became a dad for the 10th time! The 57-year-old actor and his fiancée Paige Butcher welcomed a baby boy on Friday (November 30). The couple named the little box Max Charles Murphy, weighing in at a healthy 6 lbs., 11 oz., and measuring 19 inches long. “Both mother and son are doing well,” Eddie‘s rep said in a statement. This is the second child for Eddie and Paige, who are already parents to two-year-old Izzy. Eddie is also dad to eight other children from previous relationships – Eric, 29, Christian, 27, Bella Zahra, 16, Zola Ivy, 18, Shayne Audra, 23, Bria, 28, Miles Mitchell, 25 and Angel, 11. Congratulations to Eddie and Paige! Eddie Murphy is Engaged to Pregnant Girlfriend Paige Butcher! Eddie Murphy and his longtime partner Paige Butcher are finally getting married! The 57-year-old actor is engaged to Paige, 39, his rep confirmed. Paige is currently pregnant with the couple’s second child. They have been together since 2012 and share a two-year-old daughter Izzy Oona. Eddie also has eight other children from previous relationships. Former Saturday Night Live original cast member Chevy Chase is slamming the current state of the show and giving his opinion on some of the show’s most beloved cast members like Tina Fey and Will Ferrell. For more from Chevy‘s interview, visit WashingtonPost.com.